Perhaps the best part of driver’s ed my freshman summer of high school – besides the invaluable lessons I gained in conducting myself on the road, of course – was my instructor, Wendell. Not only did he have the innate ability to grunt instructions without sounding cross, he loved donuts. A man after my own heart. Wendell took a poll one day and we all agreed that we should steer our school’s light blue driver’s ed van toward the Lamar’s Donuts one town over and load up with sugar, fat and dairy be before we set off for hours of driving practice. As a high schooler, my absolute favorite thing to get at a donut shop was a maple long john (or two) and a jug of full fat chocolate milk. Oh glory. I know, the two worst things I could possibly pick for myself nutritionally speaking. But, I was 15 years old, rail thin and going to school in the SUMMER to learn how to drive. CUT ME SOME SLACK. The moral of the story: My love for neither maple long johns nor super thick chocolate milk has faded. But what has changed is my body’s apparent inability to process dairy anymore. So, while I can still indulge in a donut every once in a while, the milk thing has got to change. Enter: Homemade Super Thick Chocolate Almond Milk. It’s dairy free and soooooo delicious! Equipment includes a decent-quality blender and a very thin towel, cheesecloth or nut milk bag. You can try with a fine mesh strainer but I didn’t have much luck (too pulpy and I’m not much for pulp in my milk). The best part is, you can make this in one afternoon if you’re in a hurry. Thanks to the genius of Kathy, we now know you can actually soak your almonds in boiling water, which makes them ready to blend into milk in about an hour! But, for those of us who aren’t in a time crunch, overnight soaking is the way to go. 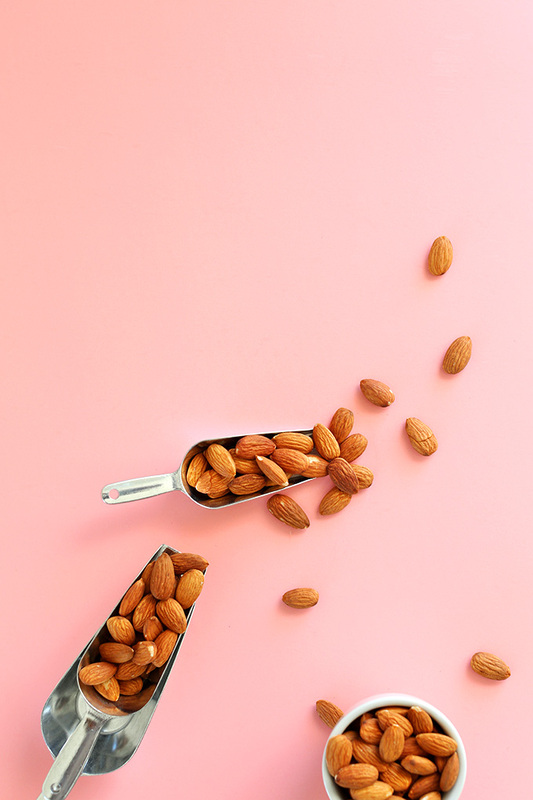 The almonds are able to take their time and soak to get all plump and doubled in size for blending. I hope enjoy this milk! I’ve nearly finished mine off and am already dreaming up other variations. Votes on flavor ideas are welcome below. 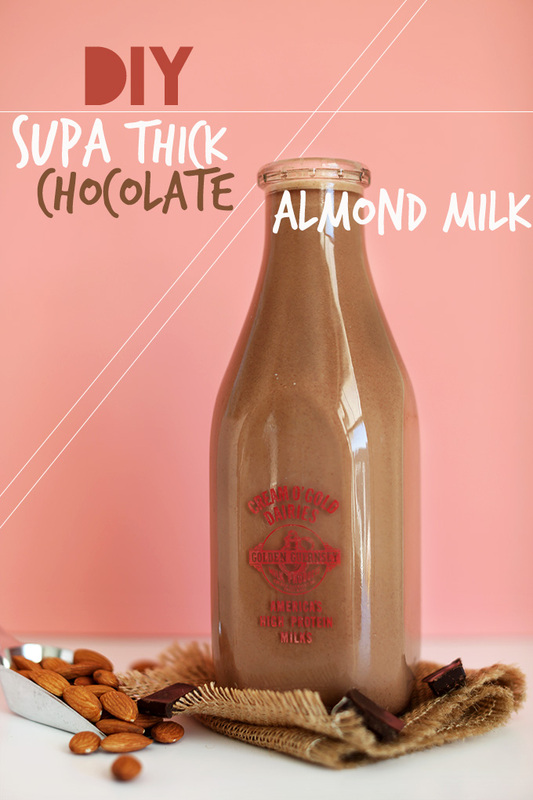 Super thick chocolate almond milk made with just three ingredients and without fancy equipment. Soak your almonds in warm water overnight at room temperature. Cover with enough water to ensure they're fully immersed plus 1 inch of water. No need to cover. If you're in a hurry, use boiling water - should reduce soaking time to 1 hour. The next day, drain and rinse your almonds under cool running water. Add almonds to a blender with filtered water (the more water, the thinner it will be) and cover tightly with lid and a towel just in case any liquid seeps through. Blend on high for 1 minute or until the milk looks creamy and only small bits of almonds are visible. To strain the almond milk you can either use a nut milk bag, cheesecloth or my favorite: a super thin clean dish towel. Simply lay the towel over a mixing bowl and pour on almond milk, then gather the corners of the towel, lift and gently squeeze the liquid into the bowl until only the pulp remains. See this recipe for more visual help. Once the milk is thoroughly strained, you can either keep the pulp to add to baked goods (such as muffins, quick breads, granolas) or discard it. Your choice. To a separate small bowl, add your chocolate and melt in 30 second increments in the microwave, or over a double boiler (a large bowl over a saucepan with an inch of simmering water). Once melted, spoon 1/3 cup of almond milk into the bowl and whisk to combine (amount as original recipe is written // adjust if altering batch size). You're wanting a chocolate "sauce" so it will more easily mix with the milk. Once combined, add to the almond milk and whisk until well combined. Taste and adjust flavor. 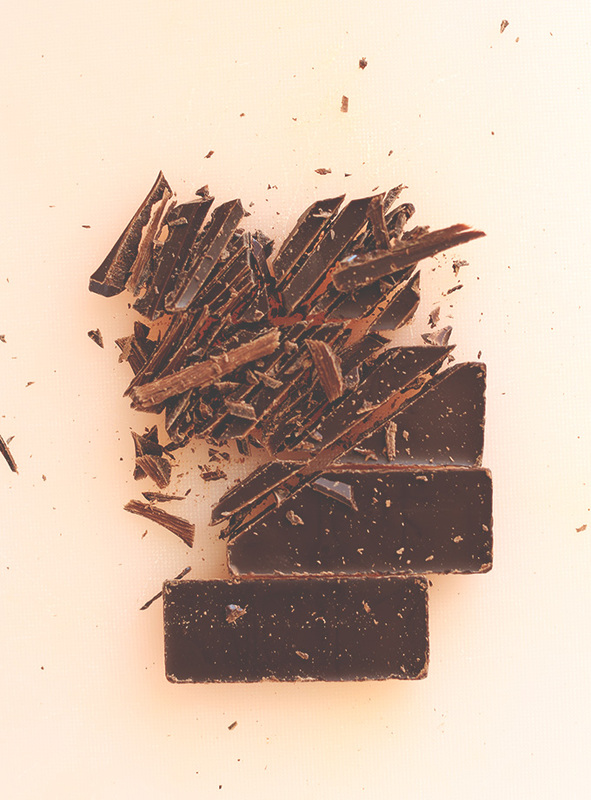 You could add more melted chocolate using the same method, or even another sweetener of choice or cocoa powder for a more well-rounded chocolate flavor. Transfer to a container with a lid and store in the fridge for several days. Shake before serving. You could also freeze this for longer-term storage. *If you don't have chocolate on hand, you can sub 1/4 cup cocoa or cacao powder and 2-3 dates for sweetness during the blending process (amounts as original recipe is written). 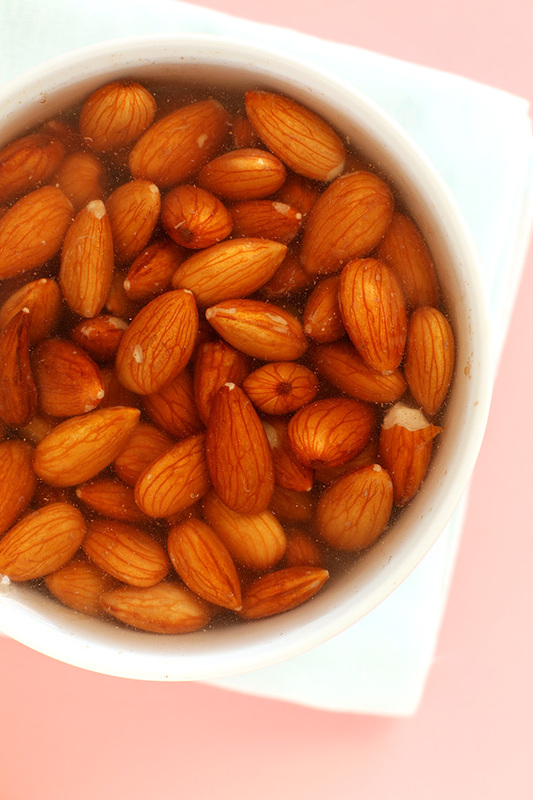 *Prep time does not include soaking almonds overnight. This was delicious and extremely decadent but expensive to make and an lot of calories. By my count, around 250 calories per serving just from the chocolate, not to mention calories from the almond milk itself. I wonder if the author really meant for you to use 1 cup (more than 2 bars worth) of chocolate, especially when she suggests 1/4 cup of cocoa powder as a substitute. I plan to freeze this and enjoy in small quantities as a sipping chocolate. Great idea to enjoy as sipping chocolate. This recipe is definitely more of an indulgent one! Love the chocolate milk. However, there is a much esier way to make this and get a thick end product. When you heat almond milk, it becomes thicker. So use the full 4 cups of water to process the almond “milk.” Add the finished milk to a saucepan and add the chocolate. Over medium heat, bring the chocolate and milk to the simmer point, whisking gently to incorporate the chocolate (do not let the milk boil). Milk will reach the consistency of whole milk and remain even after cooling. Remove chocolate milk from heat and let cool, stirring occasionally. Refrigerate or freeze as normal. Thanks for sharing your method, Melanie! How much chocolate have for used? Does it work better with 70%/80% or 55%? When you refer to cups in your recipes do you mean regular US cup which is 240ml? Hi! You can use any kind you prefer, and yes US cup! I have made this super thick chocolate almond milk twice now. It turned out delicious! My question is, after a few hours in the fridge it thickens up almost like a mousse and I am wondering what I did wrong??? It doesn’t do that when I make plain white almond milk. Hi! The only thing I could think of is the type of chocolate you used? I melted some Hershey Dark chocolate chips. I tempered that into the freshly stained almond milk them blended in my Vitamix. How much does this make in litres? Trying to figure out how much chocolate I’d need to add to make my homemade oat milk into chocolate milk! Thanks. Hi! It makes about 1L! This really is supa thick and supa creamy! Can’t wait to make this! Looks great! any way to make it last longer? Chocolate almond milk!?! My two loves combined! I am a homemade almond milk groupie. And I love experimenting with different flavor combinations: vanilla, pumpkin spice and my favorite pecan milk nog (a darn good egg nog alternative). I am definitely trying this recipe out! I’m starting my food blog this month and my first post will be homemade almond milk. Really love your site thanks for the inspiration! Can’t wait to check it out. Good luck!! So excited to try this since I have only made vanilla with a dash of cinnamon. Just recently I fell in love with chocolate almond milk with banana smoothie and since I will have to shed pregnancy weight soon, this would be better for me than shake! I would like to also suggest that pulp is excellent addition to oatmeal for those non-bakers. No sense in throwing it away- nothing wrong with freezing it or sharing it with someone! This is such a beautiful post! The pictures, the colors, everything! I’ve tried this recipe several times and absolutely love it. Thanks for posting great recipes! can’t wait to try this! i’ve just started making my own nut/seed milk and it’s actually really fun! a great tip i’ve picked up so far: if you can’t find a good strainer for the nuts/seeds, you can use a trouser sock (hopefully brand new, lol)! Since I’m still looking for a good nut milk bag, I’m using a sock from the dollar store until then! Can anyone please tell me if you can use the leftovers from the almond milk as almond meal?? Dark Chocolate is expensive here, Was wondering if we can follow the steps accordingly, and just skip the chocolate part to make quality almond Milk ? Or Can I use organic CaCao in place of the chocolate? 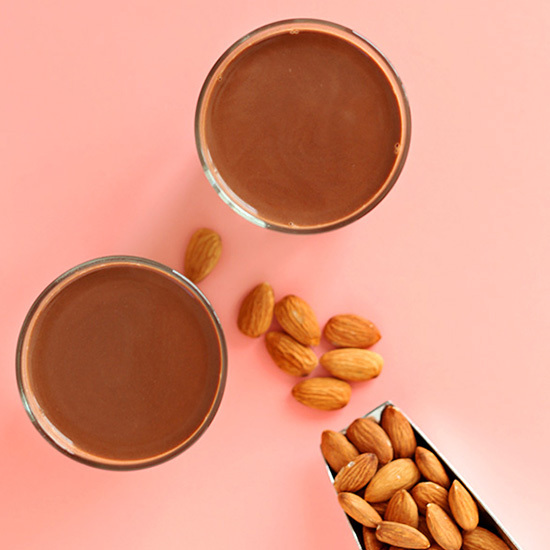 Super Delish, choco-almond milk kid approved! I’m so glad I found this. I have Celiac’s and my boyfriend is lactose intolerant, and I’ve been hankering for a good almond milk. I’ve always been so scared to make it, because I would of course screw it up, but this sounds completely do-able! I came across your site while looking for a granola bar recipe and am OBSESSED with everything you post! Can’t wait to try this. Oh yay! Thanks for saying hi, Elle! Hope you enjoy the recipe. Sadly I think the chocolate I used wasn’t the right quality for this recipe (I used ghiradelli 60% baking chips because that’s all I had on hand, they probably weren’t dark enough). Adding cocoa powder helped but the end result just isn’t quite the right flavor for drinking straight. However, this stuff is awesome for making hot cocoa and mug brownies (they are so fudgy, it’s crazy)! Thank you so much for sharing! Homemade almond milk definitely is the best! I’ll have to try this chocolate version for sure. At Veganosity we make an amazing Maple-Vanilla almond milk! You should definitely give it a try. Boiling any kind of nut over 45 degrees boils out all the nutritional values. I am definitely going to make this tomorrow with cacoa and dates with almonds. I make almond milk all the time (never chocolate, however!! Gotta try it!) and usually put in a little homemade vanilla (thanks, Joy the Baker) and a squirt of agave. I use the almond pulp just like almond meal, in muffins, etc. Just spread it out on a cookie sheet and put in a warm (not hot) oven for awhile to dry it out. I freeze it and use it whenever I need almond meal. Great tips, Cheryl! Thanks for sharing! gorgeous photos! I am going to have to try to make my own almond milk at some point! Thanks, Jenny! Hope you do! I can’t wait to whip up a batch of this! Thank you for sharing your fabulous recipes! Do you know if I can freeze the nut pulp for later use? You can absolutely freeze the nut pulp for later use – I would recommend adding it to muffins, quick breads or smoothies! I would love it if you could link a recipe or two with ideas of what to do with the nut pulp! I know you suggested adding it to baked goods, but I’m a beginner – I need specific directions! ? Gah, I want a glass of this SO badly! 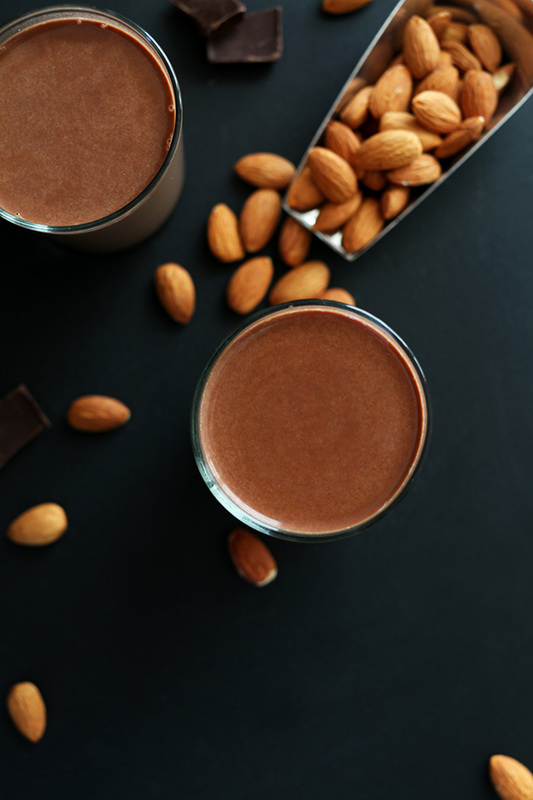 Silk makes a dark chocolate almond milk that I go crazy for…I can only imagine how much more delicious it would be to make it myself! I don’t have a high-powered blender – do you think I could get away with using my food processor? Amanda, this should work! It may not be as creamy as with a blender but it will probably do fine. Two tips I have for this method: 1) Make sure you cover your food processor with a towel as it’s likely to splash while blending. And 2) try blending the almonds twice, doing two “loads” with less water each time rather than one big batch with the full amount. This should help you get the most out of your almonds and ensure your food processor doesn’t get overloaded with liquid. Let me know how it goes! Thanks for the tips, Dana! I will definitely give it a try and let you know the result! How would you make vanilla instead of chocolate but still keep it unsweetened? Just add some pure vanilla extract at the end? I LOVE chocolate milk but was thinking of making this for using in smoothies so would like vanilla instead. Thoughts? Betsy, good question! Yes I would recommend a vanilla blended in before straining, or vanilla extract whisked in at the end. Hope that helps! Only 50 calories? Wow it tastes much richer than that! Kiran, it does depend on what kind of chocolate you use but yes, that is my estimation! So rich and delicious, right!? I’ve recently had to give up milk, and it has been really difficult. I’ve been known to go through a carton of milk a week, and now I just drink water. But this recipe gives me hope– thank you so much for sharing! I can’t wait to give it a try! Don’t give up on milk yet! I am lactose intolerant, but love the taste of milk. But now that I drink almond milk I love its taste even MORE than cow’s milk. I hope you try this recipe! Let me know if you do. I think you’ll love it. And really you could flavor your almond milk however you want. Dream big! Haha, thank you so much! I did end up trying it this weekend, and it was so delicious! Thanks for restoring my hope, and love for milk! Awesome idea!!! 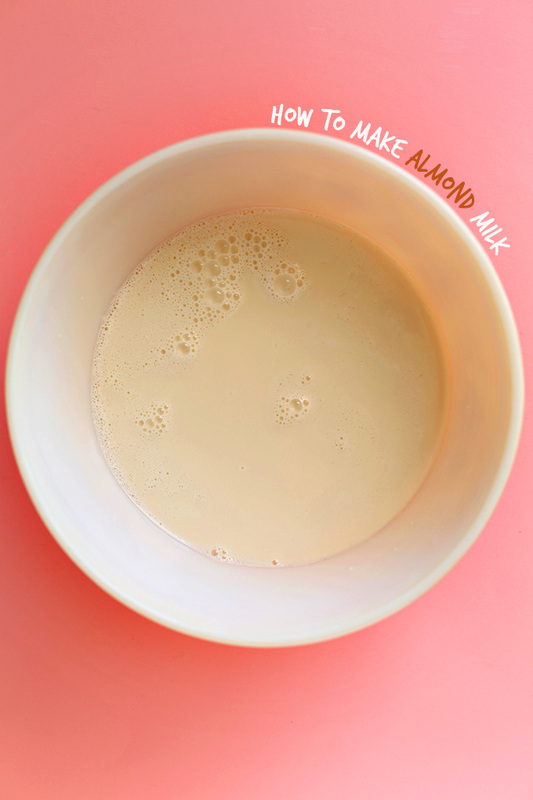 I’ve never made almond milk, but now I’m dying to try! I think I’ve died and gone to chocolate milk heaven. NEED THIS. Now I’m craving a Lamar’s donut! Only I loved the ones with the marshmallow filling. Sooooo good! I gave dessert/ refined sugar for January, which unfortunately includes chocolate, but I’ll be making this is early February – for reals. Oh yum!! So minimalist donuts next? Haha. This looks sooo good, perfect for the January blues that comes with the end of the holidays! Making this asap! Karin, YES. Minimalist donuts to the rescue. High fives. Thanks for the tip. Hope you enjoy the choco milk! You had me at supa thick. I love these photos DANA! Keep up the DIY posts…love em. Just love em! I lerv you. Thanks for the sweet words, friend! Hugs from KC! Oh I love chocolate almond milk! I have an intolerance to dairy, too – but I think chocolate almond milk is even better than chocolate cow milk. Your’s looks so fabulous! I need to try making this super soon. Abbie, I think you’re right! I like the chocolate almond milk even BETTER than the dairy chocolate milk of my youth. High fives for that! I wanted to ask how you make this “recipe list”? Thank for answer! Not sure I understand your question regarding the “recipe list.” :D Care to explain? Oh yes! Easy. Just click the print button in the recipe box, or click here. Hope that helps! These pictures are so beautiful! I did a homemade almond milk recipe myself, but couldn’t really figure out how to make the pictures stand out…after all it’s just almond milk. The pink background is super fun and I love it. I never thought to make homemade chocolate almond milk though, thanks for the yummy recipe. Thanks Karie! Yeah, I thought the pink would make a great background for the chocolate milk. Glad you liked it, too. I’ve never been a ‘plain’ milk drinker, but give me chocolate milk and I’m yours! Chocolate soy milk has a funny taste, I’ve found, and I’ve never tried package chocolate almond milk, but this looks GOOD! Also, if you use hot water to blend with the nuts, they get finer, faster, and it seems more of the richness enters the milk (melts the fats in the nuts?) Try adding only enough water to get the nuts to blend, until super creamy, then add enough to be liquid-y, blend, then strain. Or just strain the thicker mix, and add water to taste. You wanna get really crazy good stuff? Add coconut flour to the blending nuts and hot water. The resulting milk is rich enough to stand up to coffee, without breaking down or getting bitter (which almond milk seems to do in coffee). Joy! Thanks for the tips! I’m still an almond milk novice but your advice is so helpful! And coconut flour? MIND BLOWN. Thanks again! Oh, man, coconut flour!! Yeah. I ran across that in a bulk bin and grabbed up a bunch. It’s so cool. It makes a fabulous breading for tofu, too. How much coconut flour do you mix in? And do you add the coconut flour in the blender with the water and almonds? Obviously before you strain in out. It’s supa easy. Hope you try it. Thanks, Traci! Almond milk is the best! I actually prefer it to cow’s milk by a long shot. I definitely need to make this asap and after reading this post it seems that I may also have to whip up some donuts to go along with it! Beautiful pictures! I hope I find time to make homemade almond milk sometime soon, especially when the store-bought kinds are filled with questionable ingredients like Carrageenan. Ha! Me too! I’ll be sure to cook up more V-Day treats before Feb. Thanks, Hillary! This looks incredible! We’re nuts about chocolate milk over here, but since I cut out dairy and most of the ingredients in store-bought almond milk, it’s been tough. The tip about cocoa powder and dates will be especially helpful — that switch makes it totally Paleo. Thanks for sharing! 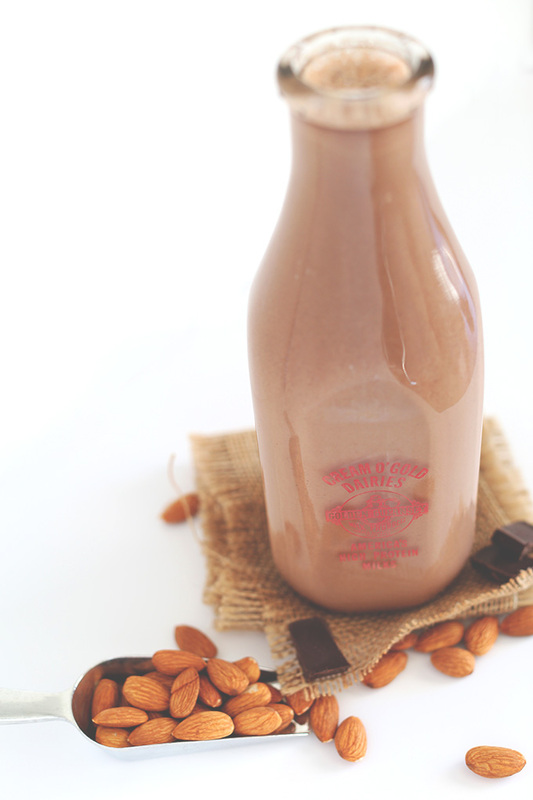 I love making homemade almond milk and chocolate milk is a favorite of mine too! I cant wait to try this! Happy New Year! 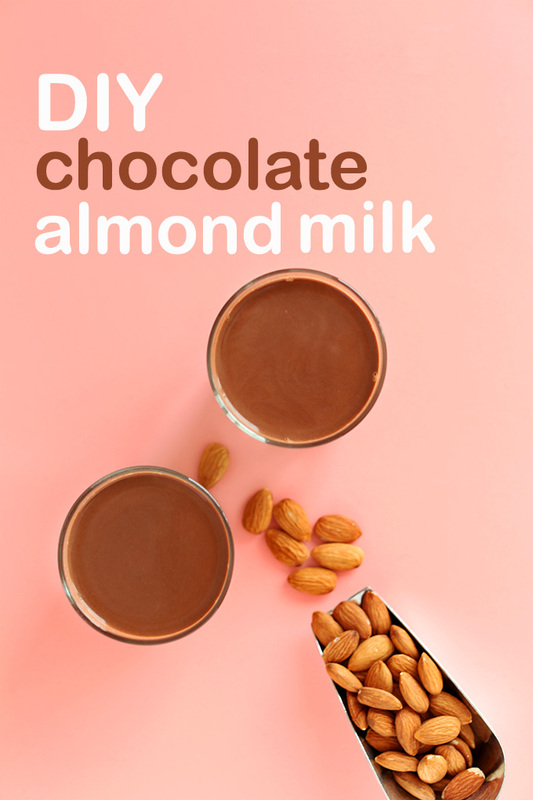 I love homemade almond milk, but this chocolate version is the best!! Yum!